The legend of some of the kings continues in different forms and is used by different political formations. These political formations draw their identity from the past and project it on the present. These sectarian streams have been using the names of different kings and glorifying them in various ways. There is a hidden message of a politics behind such efforts, as they eulogize the pre-colonial period for their political agenda. While the incidents and events are the same, the way they are looked at by different streams and different schools of historiography are very diverse. Recently in Mumbai one play is making rounds, ‘Shivaji Underground in the Bhimnagar Mohalla’. (September 2012). Similarly in Rajasthan at various places the big hoardings of Maharana Pratap have appeared. These hoardings proclaim him as the first freedom fighter. This play on Shivaji seems to be a major contribution to the theater on Shivaji after the much hyped and publicized play on Shivaji, ‘Jaanta Raja’ (Enlightened King) by Babasaheb Purandare. Purandare’s Shivaji is an anti Muslim King, with a mission to establish Hindu kingdom, he the protector of Brahmins and Cows (gobrahmin pratipalak). This is a theme song of Hindu nationalism propounded by RSS-Shiv Sena, where Kings like Shivaji fighting against Muslim Kings were the brave warriors committed to the cause of Hindu nation. Here the anti Muslim stance and pro Brahmin stance merges and upholds Cow, the identity used by Hindu nationalist’s time and over again. The play ‘Shivaji underground…’ takes a totally different stance. Here Shivaji is neither pro Cow Brahmin, nor an anti Muslim hero. It upholds the identity of dalits and targets the Brahmins. The struggle between Dalits on one side and Hindutva, upper caste, politics on the other has been manifesting in Maharashtra from quite some time. Many an events like attack on Bhandarkar Museum, banning of James Lanes book on Shivaji, which doubts the paternity of Shivaji, are few instances of this. The Braminic, Purandare version, of Shivaji gives all the credit to Dadaji Kond Dev, a Brahmin, who is supposed to have mentored Shivaji. The dalit version of Shivaji opposes this and it is due to this that the statue of Dadaji Kond Dev was desecrated recently in Maharashtra. As such the interpretation of Shivaji goes far back in our history. Phule, the dalit icon of tall stature, called Shivaji as Raja of ryots (poor peasants). Tagore praises him as ‘king of kings’. It was Tilak who saw him as symbol of Nationalism and organized a festival in his name. Purandare’s play has been made immensely popular and its popularity runs parallel to the rise of Hindu nationalist politics. The ‘Shivaji underground…’ play points out that Shivaji was not for Hindu rule in any way. He was not anti Muslim at all. The highlight of the play is its focusing that Brahmins were clerks in the courts of Muslim as well as of Hindu Kings. The play does give it a total anti Brahminic slant. This play is the first major attempt to challenge the current narration about Shivjai which is constructed around his being a great Hindu patriot. Nathuram Godse, from Hindutva; RSS-Hindu Mahasabha stable, in his book, ‘May it please your honor’, which is his statement of his defense of murdering Mahatma Gandhi in the court, states that Gandhi was a pigmy as for his nationalism was concerned. The real nationalists have been Shivaji, Rana Pratap and Guru Govind Singh. This is the line of thinking of RSS-Hindu nationalism. In this ideological understanding of RSS, all the kings who fought against Muslim rulers are Hindu nationalists. It’s a total distortion of understanding of history as kings did not fight for religion; their fights were for power and wealth. And kings of same religion also had running battles with each other. 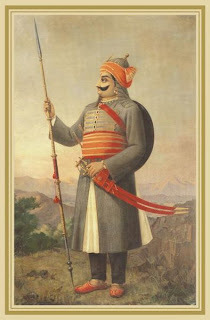 Rana Pratap, being projected as the First Freedom fighter by communal forces is against the truth. The kings before the British rule were fighting to expand or protect their empires. The era of Kingdoms is not comparable with freedom movement. Just fighting against Muslim King is not being a freedom fighter. Freedom struggle was against British rule, when India was coming to become ‘a nation in the making’ due to industrial, educational and social changes. The era of Kingdoms and logic of Kings can in no way be compared with the Indians coming together to fight the British Empire. Even these kings be it Shivaji or Rana Pratap were neither ruling for religion not for Hindus. Their administration was having both Hindus and Muslims. Their armies were also mixed ones with Hindu and Muslim Generals both, with Hindu and Muslim soldiers both. Rana Pratap had Hakim Khan Sur on his side and Shivaji was having Siddi Sambal and Rustam-e-Jamaan amongst others. 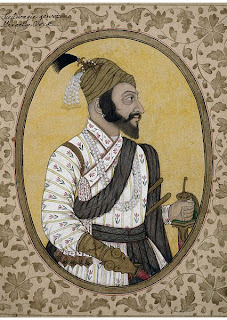 Shivaji’s confidential secretary was Maulana Haider Ali. Shivaji had reverence and respect for the holy people like Hazrat Baba and Ambrose Pinto. Rana Paratp’s battle against Akbar was not for religion. It was on the issue of Mansabdari (status in the administration). Rana Pratap was asking for a Das hazari, (ten Thousand) Mansab) while Akbar was offering only Panch Hazari. (Five thousand). Interestingly Akbar never came to Haldi ghati where the battle took place. It was Akbar’s commander in Chief Raja Mansingh, assisted by Shahjada Salim, who fought against Rana Pratap. By no stretch of imagination it is anywhere close to a Hindu Muslim battle or a struggle for nationalism. As a matter of fact Tilak and the later genre of Hindu nationalists associating Shivaji with nationalism are totally off the mark as the term nationalism is a recent one coming up with the rise of nation states. The confusion between Kingdoms and nation states opens the window for communalism to infiltrate in a big way. In Shivaji’s case now a new frontier of presentation has been opened up. This is that of Dalit-OBC on one side and Brahmins on the other. This is an interesting aspect reflecting the current struggle between these two social groups. The play, ‘Shivaji underground…’ is veering more around this theme while equally powerfully quashing the communal interpretation of Shivaji. One observes that dalit bahujan version and Brahminic versions are polar opposites. Dalit The role of Brahmins against Shivaji is particularly worth its mention. One does recall that the local Brahmins had refused to coronate Shivaji on the grounds that Shivaji is a Shudra. It was the priest from Kashi, Gaga Bhatt, who coroneted him with the little toe of his left foot, the organ in the body which is lowest in the hierarchy, as per Braminic norms. This play highlights the role of Krishnaji Bhaskar Kulkarni, an official with Afzal Khan. But again it is not a question of this or that religion; Brahmins were working for most of the kings, irrespective of their religion. So while Shivaji and Rana Pratap have to be seen in the proper light, as kings with valor, the other interpretations of nationalism, freedom fighters, anti Muslim Kings are all constructs emerging from the communal historiography and need to be dumped. Also what needs to be brought in the arena of the history is the pain and pleasure of average women and the men. What needs to be projected is the interaction of cultures which were the foundation of human progress, cutting across religions. It is India’s arrested transition to a democratic society due to which the Kings are being brought to glory and identified with. Whatever the virtue of king of any religion, in current times we need icons who were part of India’s freedom movement, a struggle running parallel to the struggle for caste and gender equality. While projecting the kings as heroes, we do need to remember that it was the system of peasants’ exploitation, which was the base of kingdoms. Surely kingdoms are no systems to emulate today and so need to rethink this iconization of Kings! It is sad that one cannot say anything on such subjects in our society without being accused of being parochial or at least partisan. Nevertheless assuming we all (including me) are liberals folks on this thread, who like to take a balanced view of things, it begs to say the following: Growing up in modern day Pune as a person of Maharashtrian Brahmin ancestry, it is easy to visualize how Jews must have once been demonized in the West. And how many a well-meaning intellectual, may have contributed to the hatred against them, and the eventual Holocaust. May I be proved completely wrong, Amen! I fail to understand the connection you have made between Mahrashtrian Brahmin and Jews. Even if there is such a connection, what exactly is its relevance to the topic discussed in this article?